What is graphic designing ? Principles of graphic designing ? POSTED BY Corweb ON 23-Jan-2019. Presentation of ideas in form or posters and print images is called graphic designing, is often use to express person ideas or the promotion of brands or people businesses. Peoples often look for experts to promote their products and deliver initial message of what they are selling and what services they offer, some graphic designers work in televisions and in film industry their job is to write story board a sequence of a story. It is an art of solving problems with use of visual images, typography by using various tools and techniques of graphic designing. Main concerned of this art is combining and inventing the ideas and focusing on what is important and what isn’t. Line is the basic element used for the purpose of connecting content, pattern creation and word phrases. Lines can be straight or curved. Is the names given to colours i.e. (red, yellow, green blue etc). Colour value refers to the mixing and changing of the colours for example how dark it is and how light it will be, mixing white in black etc. It is the third element of designing focusing on the contrast, shades and tones of colours. This element focuses on drawing the objects by drawing lines. It refers to 2 dimensional enclosed areas (2D). Visual texture is 2 dimensional (2D) form of texture and actual is the 3 dimensional (3D) form of texture. Spaces is an area provided by designer to object including background ,front etc two types of space are negative space and positive space. Negative space is the area around the object and positive space is the area occupied by the object. Typographers are those who designed fonts of words. In the modern world it is important that we stay updated in this era of technology where everything is coming online if you buying something so many e commerce platforms are available also if you selling anything you can sell your product online. Just posting your product online is not the only thing to do, promotion is the most important part which makes your product visible to the viewers, and for this people hire graphic designing services to promote their post by designing their ads. 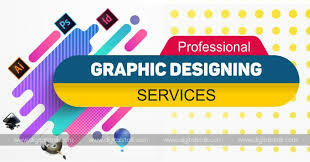 Especially in Lahore where designing industry is growing rapidly, Graphic designing services in Lahore helping companies promoting their products by giving their skills and services and inspire their audience with their work. A good designer uses the elements to their thoughts and ideas and applies it on the principles of designing, clearly understand what he is doing and want to achieve.